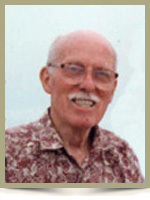 MUNHALL, Robert Leach (1917-2011) Bob, a quietly gentle man, passed suddenly on Monday, Feb 14, 2011 at his home in Mill Village, Nova Scotia. He was the son of Horace Eugene and Ryllis Munhall of Cleveland, Ohio and Long Island, N.Y. where he grew up. Bob was educated at Port Washington High School, The Art Students League of New York and, under the G.I. Bill, Columbia University. In 1944 he met and married Mary, his warbride, in North Devon, England. While serving as a 1st Lieut. in the 107th Ordnance Company, US Army, he was involved in the waterproofing of vehicles in preparation for the D-Day landing in France, during WW2. In recognition of his service at the Battle of the Bulge he was the recipient of a Presidential Unit Citation. Upon the end of hostilities Bob was one of several US Army officers selected to serve as “interim Mayors” of recently occupied German cities. In that capacity at Reichenbach on the Czech border he maintained order and administered the distribution of supplies. Following demobilization in 1945 Bob returned to the advertising business as a graphics artist, spending much of his working life at McCann-Erickson Inc. in NYC, but in 1963 setting up his own studio. In 1993 Bob and Mary emigrated to Canada and settled in Mill Village, Queens County, where they spent 17 happy and contented years, surrounded by the beauty of woods, water and wildlife. Bob is survived by his wife Mary, his sons Robert and Michael, his grandsons Trevor and Matthew, and his sister Martha Benzle. Deeply missing him is his devoted Beardie, Rosie Dog. To Mary and Family, I am so sorry to hear of Bob’s passing, my thoughts are with at this sad time. My sympathy to the family during this sad time. I will always remember Bob at our family history meetings several years ago. He was a great guy! To Michael – Our condolences on the loss of your father. May his memory be a blessing to all who knew and loved him. please accept my deepest condolences. Robert’s son Mike was one of my Favorites while at Leelanau Schools, a Fair, Honest, Compassionate Man, an Excellent Coach and I know Mike learned these qualities from Family. Robert’s Legacy lives on. I never met Mr Munhall, but I know he was a good man, because he raised an amazing son in Mike. My prayers for peace are with you, his family, as you say farewell. Mike, Sorry to hear about your dads passing. So sorry to hear of your loss. My thoughts and prayers are with you all at this difficult time. We really share your sorrow, Mary, and are pleased to say that we called Bob our friend. Many stories and smiles were shared here at the Post Office in Mill Village and all of us will miss him greatly. I hope that you know that we are here for you at this time. Keep well and take strength from the presence of your two sons at this time. What a joy to have loved and to have been loved by such an interesting and gentle man. I have heard a lot about you and your husband through the years from your son and grandsons. I celebrate his life with you. Thinking of you all during this transitional time. Oh, Life divine that owns each waiting hour. Keep though thy child on upward wing tonight. Dear Mary, Mike and Rob: We will always treasure our memories of our wonderful Uncle Bob. He was a significant inspiration and will always be my guiding light. I remember meeting you both at Mike and Sally’s wedding. I loved reading his obituary-a life well lived! How very special for both of you to have been together for so long and to have accomplished all that you have done in such a beautiful way. Just seeing the pictures that Mike has taken of your home is heart warming, so much beauty and love. In these times of turmoil in the news it is grounding to know there are good people like both of you enriching our world. I am so grateful that Jesus came to show us that Life is eternal, and proved it for us in his resurrection. What a tremendous gift for all of us who feel like we are left behind, to know that there is no death, that life is a continual unfoldment for us all, constantly. Much love to you as you go forward into your next adventure. I strongly recommend a young cat for the added antics and enthusiasm they bring to all of us to make each day more fun and joyful.